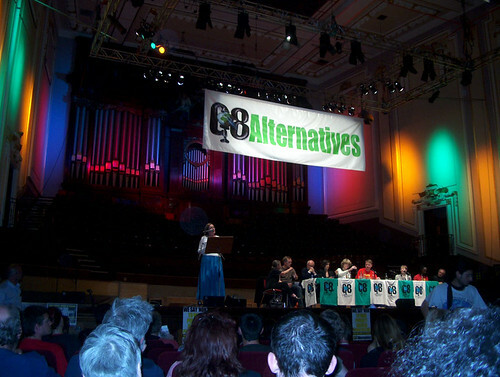 G8 Alternatives Summit, originally uploaded by alister. Frances Curran MSP speaking at the Usher Hall on Sunday night as part of the G8 Alternatives counter summit. A very successful and educational day which will do a lot to bring a movement together in Scotland. Excellent speeches from the likes of George Monbiot and Susan George. The only downer was at the conclusion of George Galloways speech. I applauded but didn't stand (I only stand for exceptional individuals) and was berated by an outraged Galloway fan because I wouldn't stand up. I still didn't stand up. Elevated to the status of demi-god and you refuse to stand, shame on you Alister! Some people might think you are one of those Socialist types who believes in egalitarianism. I'm with you guys. He was good, but Hell he wasn't that good...Frances was better! "a Scottish Socialist MEP (crow barred on to the stage, no one outside of Scotland had heard of her)"
What an extraordinarily chauvinist statement. Frances was there as a representative of G8 alternatives who organised the rally and we were IN Scotland. She was also there because of the key role she played in organising the gleneagles protest which included being barred from parliament for a month, losing all her pay and her staff's pay and office space because of a protest for the right to march at gleneagles. He doesn't know what an MSP is (not the same as an MEP Guy) maybe he doesn't know that we have our own parliament and political parties. Typical anglo-centric worldview. Yes and the whole point being the Summit was attempting to be inclusive and internationalist. It's always good to hear a wide range of views, whether you agree with them or not. My pal's involved with RESPECT, but they have to play by OUR rules in Scotland!